Security Torx Screws are the ideal choice for electrical screws as they offer the most comprehensive range of operational lengths. Security Torx Raised Countersunk Machine Screws are also known as Pin Torx Raised Countersunk Machine Screws or 3.5mm Electrical Screws are manufactured from A2 Stainless Steel. The use of 3.5mm Tamper Proof Electrical Screws to secure 240v switch and socket faceplates, is typically specified as part of the safety strategy and policy in; schools, hospitals and public buildings among others. There are many places where you may want to prevent unskilled or unauthorised persons from tampering with the wiring at your electrical sockets and lightswitches (ie: curious or malicious pupils in the school environment, the DIY member of staff trying to be helpful in the workplace, etc), fortunately there is a simple solution. When substituted for the standard electrical screws supplied with 13amp power sockets or wall type light switches, these anti-tamper screws prevent unauthorised access to the electrical wiring. The screws secure the faceplate or switch cover to the back box and require a matching security driver tool to install or remove. Security Torx 3.5mm Electrical Screws are available in a range of lengths from 12mm to 75mm, to ensure that there is a suitable size for use with any backbox, etc. 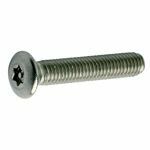 These special raised countersunk machine screws are manufactured in the electrical industry standard 3.5mm gauge and a matching T10 size Security Driver or Security Driver Bit is required to do up, or undo the screws.